Guns in trunks is a story about lobbyist money and scare tactics, but it’s also a stark reminder that laws often have unintended consequences. While some legislators undoubtedly believe in the bills, for others, the answer of course is money. Nationally in 2014, the NRA donated $978,902 to candidates and campaigns, spent $3,360,000 for lobbying efforts, and $28,029,871 in “outside spending.” In 2014, the NRA donated only $3,100 here in Tennessee. However, in the 2012 election cycle, the NRA dropped a whopping $141,114.29 in Tennessee. 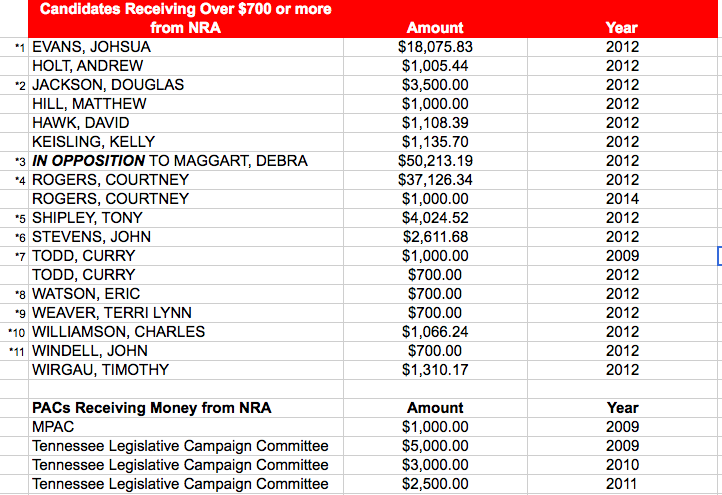 Some of that was spread around in smaller financial support of various campaigns but the largest sums of money were spent to elect new NRA-favored, Tea Party candidate Courtney Rogers and to destroy her incumbent opponent Debra Maggart. Records show that Rogers was given $37,126.34 in monetary contributions and ads, mailers, and other campaign materials. Records also show that the NRA spent $50,213.19 on attacks against Maggart. The power being leveraged by the NRA isn’t really about how much money they’ll donate to a candidate or even whether they’ll donate. It’s the implied threat of how much money they’re willing to spend to get you out of office if you don’t vote the way they want you to. Do what we tell you to do or else. Case in point- Debra Maggart. In 2011, a bill was filed to force private business owners to allow employees to store firearms in their vehicles. Many private business owners objected to this as did various chambers of commerce. Also speaking out against the bill was the largest employer in the state, FedEx, based in Memphis. 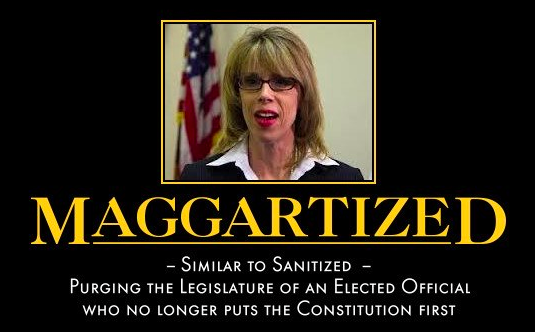 Republican Rep. Debra Maggart of District 45 had served as chair of the House Republican Caucus, was a handgun permit holder, life-long NRA member, had an A+ rating by the organization and had worked in a family business that sold firearms. She had been a staunch supporter and reliable voter on previous pro gun legislation and had co-sponsored 10 bills to loosen gun laws. But, as a conservative focused on the rights of business, she found herself in a quandary when she looked at the guns in trunks bill. In an interview with Anderson Cooper, Maggart described what happened to her. The NRA wrote the bill requiring all property owners to allow guns on their property in direct violation of Tennessee’s property owners’ rights and then refused to allow compromise with the legislature. No opt out and no immunity for property owners whose property, through no fault of their own, was the site of a tragic accident or crime. The NRA would not compromise and Maggart could not betray her constituents’ most basic property rights, a strong tenant of conservative ideology. She was left with no choice but to vote against the bill. Retribution was swift and merciless. 2012 was an election year and the NRA intended to oust Maggart and make an example of her. Her former A rating with the NRA was downgraded to a D. The NRA launched a massive smear campaign with 12 full page newspaper ads. They bought radio ads, robo calls and hired a web developer to create a professional “Defeat Maggart” web site. A YouTube video featuring their chief lobbyist explained to NRA members why she “should be defeated” as did the nine mailers they sent to members. They placed three billboards with her picture alongside President Obama’s to designed specifically to link Maggart to the Democratic President in her staunchly conservative hometown. Days later, in a New York Times op-ed piece titled “The NRA Protection Racket” , Richard Painter, former Chief Ethics Counsel for President George W. Bush, detailed the NRA’s use of intimidation tactics to get their legislation passed (He is also interviewed in the Anderson Cooper clip). Painter compares the tactic to an “old world” protection racket. Candidates live in relative security so long as they pay their dues to the “boss”. If they do as they are told, the “boss” will help them fend off incoming attacks from the other side, but step out of line just once and their political life is over. But, in Tennessee, it’s not just the NRA who influences Tennessee gun legislation with money and the threat of “primarying”. The Tennessee Firearms Association, which calls itself “Tennessee’s Only No-Compromise Gun Group”, spent $15,387.53 in 2012 to help Rogers defeat Maggart. And, in 2014, the candidate they gave the most money to was Republican Steve Gawrys, a Brentwood business man, who was running against longtime House District 61 incumbent Charles Sargent in the Republican primary. Their problem with Sargent? He voted against the Gun in Parks bill in 2014. Sargent barely survived the attempt to “primary” him, winning his seat by a margin of only 255 votes, but he seems to have learned his lesson. This year, of course, he has defended and spoken in favor of the guns in parks bill, despite its confusing language and the fact that no one seems to understand exactly what it means. 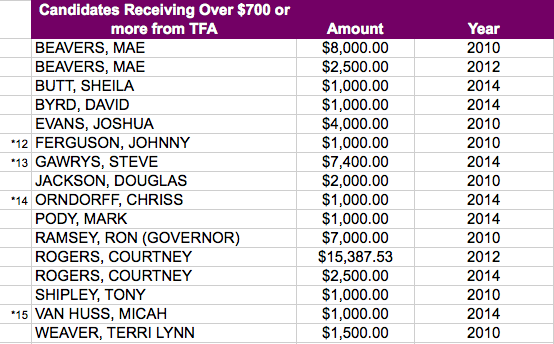 Below is a spreadsheet of both NRA and TFA contributions from 2009 – 2014. The information was obtained from the online database of campaign finance disclosures and exported in an excel spreadsheet that could be sorted. The first worksheet is an overview and a screenshot of it is included below. The other worksheets are breakouts of the contributions by organization, by candidate, and by year. GVP advocates are asked constantly why we think legislators continue to sponsor these kind of bills and double down on that support even in the face of tremendous opposition. The truth is some of the legislators do believe in this “more guns, more places with less regulations” mentality. But, when you look at these numbers and when you look at the “examples” that have been made of legislators who don’t follow orders, it’s obvious that some of them are too afraid to ever speak out. This is not the kind of politics we need in Tennessee. We don’t need to live in fear of the “mob” and we don’t need to cater to politicians who do. Note: “Guns in Trunks” was passed in 2013, a year after Maggart lost her primary. Since then, gun thefts from vehicles have skyrocketed across the state. Also, Memphis, where gun thefts went up 256 percent since passage of the bill, broke a two decade homicide record in 2016. Knoxville broke a 19-year homicide record in 2017, and that same year, Nashville came close to breaking an all-time homicide record.